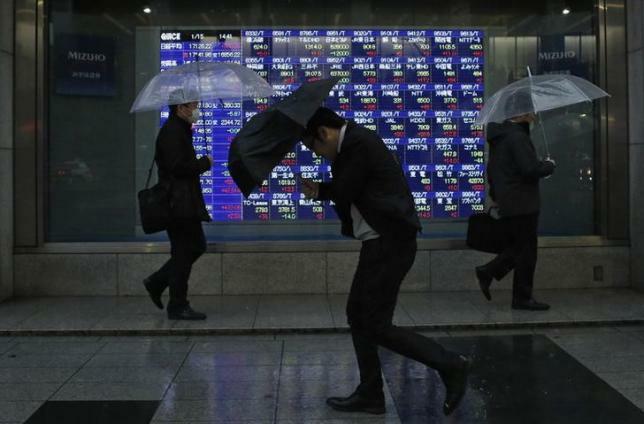 TOKYO – Asian shares rebounded from one-month lows on Friday, helped by signs global bond markets are stabilizing after a big selloff, though investors were on guard ahead of US jobs data and crunch talks between Greece and its creditors at the weekend. Sterling jumped more than one percent against other major currencies after British Prime Minister David Cameron appeared set to govern Britain, showing surprising strength in a tightly-contested election. MSCI’s broadest index of Asia-Pacific shares outside Japan .MIAPJ0000PUS rose 0.4 percent, recovering from a one-month low hit earlier. Japan’s Nikkei .N225 ticked up 0.4 percent from one-month low hit on Thursday. Investors breathed a sigh of relief after the global bond market rout since late April appeared to have run its course for now. “Yields have risen to levels that would attract investors,” said Chotaro Morita, head of Japan rates strategy at SMBC Nikko Securities. Buying of government bonds resumed after yields reached key levels, including 0.8 percent in German Bunds DE10YT=RR, 1 percent in French bonds FR10YT=RR and 2 percent for Italian and Spanish bonds. IT10YT=RR ES10YT=RR. Europe has been the epicenter of a rout as investors rushed to exit crowded long bond positions built up to take advantage of the European Central Bank’s quantitative easing. “Hedge funds were taking profits (in European bonds). There could be more profit-taking in the near term but bond yields can rise only so much considering the ECB’s quantitative easing,” said Fumio Nakakubo, chief investment officer at UBS in Tokyo. Bonds were also helped by a fall in oil prices: A steady rise in oil prices since March had been cited as one reason behind the rout in bonds as higher oil prices tend to boost inflation – a major risk for fixed-income investors. The yield on US Treasuries US10YT=RR, the benchmark for borrowing costs globally, also ended an eight-session rise, helping to underpin Wall Street and global equity prices. In addition, strong quarterly results from Alibaba (BABA.K) as well as speculation that consumer review website Yelp.com could be for sale drove technology stocks higher. S&P 500 Index .SPX rose 0.38 percent, with the S&P tech index .SPLRCT up 0.87 percent. China’s mainland stock indexes .CSI300 trimmed gains to be up 0.9 percent after news China’s exports contracted 6.4 percent in April from a year ago, sharply missing expectations for a 2.4 percent gain and fuelling fears about the health of the cooling Chinese economy. The Chinese yuan CNY=CFXS was flat at 6.2076 against the dollar. Many investors now look to the US employment report due later on Friday, with traders expecting nonfarm payrolls to recover to gains of 224,000 in April from a shockingly low 126,000 in March. Another weak reading could deepen worries that the US economy may not be gathering momentum. “The US economy had virtually a zero growth in January-March. If it remains weak after April, a rate hike by the Federal Reserve may be delayed further,” said Shuji Shirota, head of macro economics strategy at HSBC Securities in Tokyo. In the currency market, the British pound jumped about one percent to $1.5390 GBP=D4after exit surveys showed Prime Minister David Cameron’s Conservatives may continue to govern Britain. The polls gave the Conservatives 316 of 650 seats in the lower house of parliament, still short of a majority but far better than expected. The party was seen winning more seats than previous polls had indicated, although it remained shy of securing an outright majority. The opposition Labour party was seen at 239 seats, less than previously expected. The euro sagged to $1.1251 EUR= from a three-month high of $1.1392 hit on Thursday, on a fall in European bond yields and concerns about Greece’s precarious financing situation. Greece defied its international creditors on Thursday, refusing to cut pensions or reverse re-hiring some public employees to meet their demands, dimming prospects of progress next week towards securing financial aid. Athens is seen running out of cash ahead of its 750 million euro payment to the International Monetary Fund on May 12 but has refused to accept unpopular reforms promised by a previous government.